Here is a simple, quick and healthy dessert. Need more? It's also delicious. I love figs, normally I eat them as they are, but this time I decided to do something different with them. 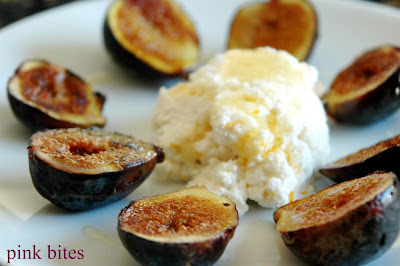 All I did was grill the figs quickly and then make some flavored ricotta to go with it. To grill the figs, I actually used a non stick pan sprayed with some canola oil (just a little bit). My BBQ grill is too messy and the space between the grates is too wide to hold the figs. But it can also be done in an indoor grill. I flavored the ricotta two different ways. One was with almonds (pictured bellow) and on the other I used vanilla. Mix ricotta cheese with some vanilla extract, lemon zest and a bit of honey. Drizzle some extra honey over the top. Mix ricotta cheese with almond extract, orange zest, a tiny bit of the orange juice and some honey. Drizzle with extra honey and top with toasted sliced almonds. 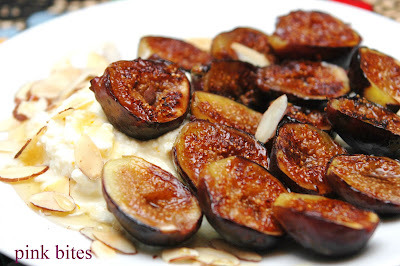 Serve the ricotta mixture aside the warm figs. It makes a nice hot/cold contrast. 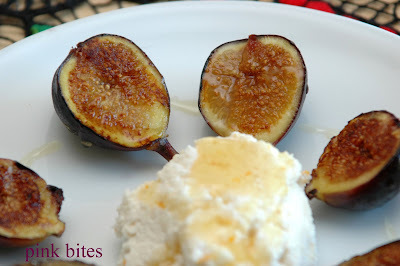 Two great ways to enjoy figs! Looks delicious and the perfect answer to what to do with the last of the figs ripening in my backyard right now! 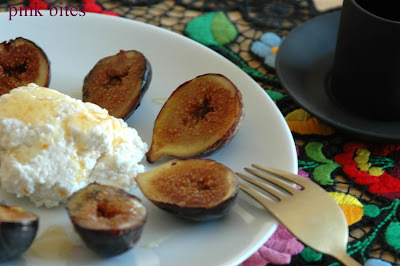 Grilled figs with ricotta are simply divine.